New camera module connected to the CAN bus of the vehicle using HD cameras, 2x WIFI, GPS and cloud technology with 2x 4G / LTE and with HW electronic key is being tested and is a complete new product in the market. Thanks to the battery, the module can also be used for monitoring of containers and collection boxes without the connection of permanent electrical voltage. 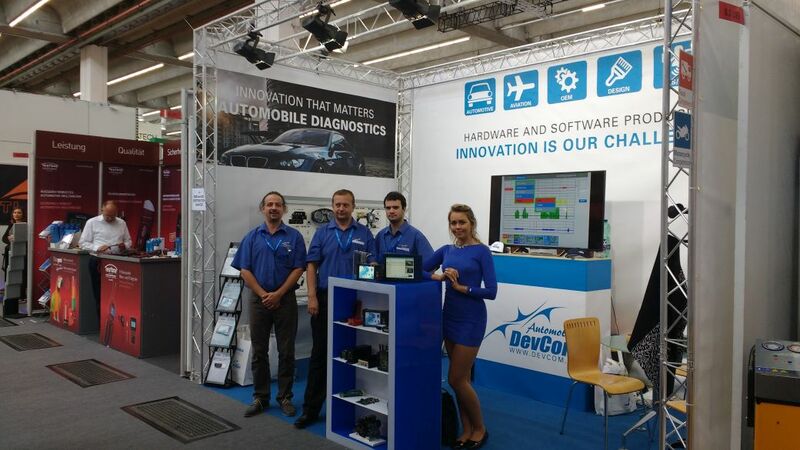 DevCom Ltd from Prague, Czech Republic introduces new SW and HW developments in the field of automotive diagnostics and GPS / GSM telematic security at the largest automobile fair in Europe - AUTOMECHANIKA FRANKFURT 2018. On 22 and 23 February 2018, there was held the 24th national professional competition AUTOMECHANIK JUNIOR 2018 - REGIONAL WHEEL - PRAGUE concerning mechanic repairs of motorized vehicles. This year it was organized by the SPŠD a.s. in co-operation with Škoda Auto Brejla and DevCom Ltd., the main sponsor and manufacturer of automotive diagnostics. Petr Bärtl has been appointed as the Head of Sales and Marketing at DevCom, a leading Czech manufacturer and developer of automotive diagnostics, aircraft instruments and industrial systems.